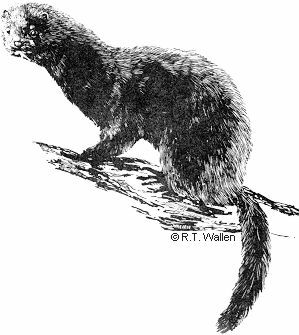 The Mink (Mustela vison) and other fur bearing animals attracted trappers, traders, and settlers to Alaska from around the world. Some of the most valuable furbearers belong to the Mustelidae or weasel family, which includes the Mink. Other members of this family in Alaska include weasels, marten, wolverine, river (land) otter, and sea otter. Mink are found in every part of the state with the exceptions of Kodiak Island, Aleutian Islands, the offshore islands of the Bering Sea, and most of the Arctic Slope. A Mink's fur is in prime condition when guard hairs are thickest. Mink are then a chocolate brown with some irregular white patches on the chin, throat, and belly. White patches are usually larger on females and often occur on the abdomen in the area of the mammary glands. Several albino Mink have been reported from Alaska. Underfur is usually thick and wavy, not longer than an inch. It is dark gray to light brown in color with some suggestion of light and dark bands. The tail is one third to one fourth of the body length with slightly longer guard hairs than the body. Adult males range in total length from 19 to 29 inches (48-74 cm). They may weigh from three to almost five pounds (1.4-2.3 kg). Females are somewhat smaller than males. In Alaska, northern Mink breed about two weeks later than those further south, because onset of breeding is determined by the beginning of long days. The breeding season extends from March through April, depending on the latitude. Males and females may breed with more then one other Mink. The young within a single litter can be the result of fertilization by different males and/or two different ovulations more than a week apart. The total gestation period varies from 40 to 75 days. In Mink and other weasels, the fertilized egg does not attach to the uterus to develop right away as in most mammals. This delayed implantation accounts for the great variation in length of the gestation period. Once the egg implants, fetal development takes about 30 days to complete. In Interior and western Alaska most births occur during June. Differences in the abundance of food available to the mother affects the number of young born and the number that are weaned. Litter size varies from 4 to 10 kits. The den is generally a burrow or hollow log near a pond or a stream. In most cases the den used has been constructed and deserted by other animals. Young Mink remain in the den about a month. They grow rapidly and attain their adult size by September. In the following spring they may breed and raise their own young. Little is known about the overall effects of other predators on Mink populations. Occasional predators of Mink include wolves, foxes, hawks, owls, lynx, and river otters. The relationship between otters and Mink is unclear. If there are otters along a stream, usually they will not tolerate the presence of Mink within their territory. Mink trapping provides both recreation and income for some Alaskans. Trapping Mink as a livelihood requires an unusual amount of stamina, perseverance, and knowledge of the animals' habits. The value of Mink furs, or pelts, changes dramatically depending on the current demand in the fur clothing business, and the trapper's income may go up and down accordingly.